Οι αγώνες είναι στο αίμα μας, ήταν φυσικό να δημιουργήσουμε την GT3 έκδοση της MP4-12C. Έχουμε μια θρυλική ιστορία στον παγκόσμιο μηχανοκίνητο αθλητικό, συμπεριλαμβανομένων και των αγώνων της κατηγορίας GT. Στόχος μας είναι να διατηρήσουμε την φήμη αυτή με την νέα MP4-12C GT3 αλλά και με τα μελλοντικά μας αυτοκίνητα. Η McLaren MP4-12C GT3 θα λάβει σε μερικούς αγώνας μέσα στο 2011 ενώ πλήρη συμμετοχή θα έχει από την μεθεπόμενη χρονιά στο Ευρωπαικό πρωτάθλημα της FIA GT3 2012. Τα αυτοκίνητα θα είναι διαθέσιμα στους ενδιαφερόμενους με “άκρως ανταγωνιστική τιμή”. 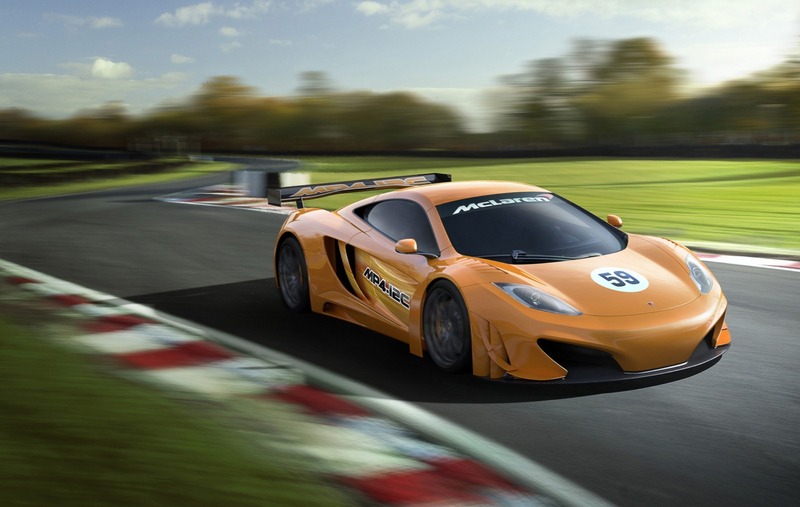 WOKING, UK (Dec 17, 2010) – McLaren today confirms its plans to bring back the McLaren name to GT sports cars racing. From 2012, McLaren and CRS Racing will supply and support a limited number of GT3 racing cars based on the McLaren MP4-12C high-performance sports car for European-based privateers. 15 years since the McLaren F1 GTR famously won the world-famous 24 Heures du Mans (Le Mans) on its debut, and 12 years since six ‘Longtails’ last raced at Le Mans, McLaren and CRS Racing, a successful and experienced UK-based racing team, have begun development work aimed at turning the 12C road car into a race-winning GT3 sports car. As part of the development programme, McLaren and CRS Racing will compete at a limited number of European GT races in 2011. With the 12C’s revolutionary lightweight one-piece moulded carbon chassis (the ‘MonoCell’), its high levels of downforce and aerodynamic performance, and its focus on form and function, the 12C should prove to be a great platform on which to develop a racing car, as well as visually setting pulses racing at European race tracks. Martin Whitmarsh, Vodafone McLaren Mercedes Team Principal said: “Racing is in our blood – it was natural to develop a GT3 car alongside the 12C road car. We have a legendary history in global motorsport, including GT racing, and we aim to maintain that reputation with this GT3 programme, and any future sports car projects that may evolve. Further details about the McLaren 12C GT3 racing car programme will be announced in 2011 and interest from prospective customers can be registered on www.mclarengt.com. Initial plans are for a limited run of 12Cs developed for the 2012 European FIA GT3 Series, but, as with McLaren Automotive’s road car business, conservative growth and expansion will be considered. CRS Racing will build, sell and support the 12C GT3 cars in close collaboration with McLaren. The Leicestershire-based racing team has a strong pedigree in GT racing in the Le Mans Series, the FIA GT Championship, the International GT Open and the British GT Championship. CRS also runs two successful single-seater teams: in the Formula Renault UK Championship and as Atech CRS in the GP3 Series. Defined by race wins in a broad series of global racing championships, McLaren is the most successful motor racing team in history. No other racing team has won the ‘triple crown’ of Le Mans (on debut), Indy 500 (three wins) and Formula 1 World Championships. In the North American Can-Am race series McLaren won 43 of 71 races, taking five titles between 1966 and 1972. In Formula 1, McLaren has won 169 races: better than one in four of the races in which it has competed since 1966, and more races won per season competed than any rival (3.75). These wins have resulted in eight Constructors’ Championships and 12 Drivers’ Championships. McLaren, and Ron Dennis’ influence on Formula 1 has been manifest. In 1981, Dennis’ first season as Team Principal, the McLaren MP4/1 became the first-ever race-winning car featuring a carbon fibre-based monocoque chassis. This revolutionary design, inspired by aerospace technologies, has since become the standard chassis structure for racing teams: lightweight, safe, strong, and dimensionally predictable. 1993-1997: McLaren F1: The McLaren F1 was, and in many eyes remains, the definitive sports car: the first road car with a carbon fibre construction. Just 106 examples of this iconic supercar were made (72 road cars, 28 racing cars, six prototypes), but recent auction prices for F1s value the standard F1 road car at between £2 – £2.5 million, almost five times its original retail price: appreciation unheard of in a modern car. It was also the last true road car to win Le Mans and the first to achieve this feat since the ‘60s. 2003-2009: Mercedes-Benz SLR McLaren: The SLR was conceived and styled by Mercedes-Benz as a powerful, touring sports car before being presented to McLaren Automotive to engineer, develop and manufacture. The SLR was prodigiously fast, exclusive and a technological tour de force. With over 2,200 examples produced by McLaren, the SLR became the most successful ultimate supercar ever built, selling more than twice as many as the next best-selling carbon based car (Porsche Carrera GT). 1995: with an F1 GTR piloted by J.J.Lehto, Yannick Dalmas and Masanori Sekiya, McLaren won on debut; four other F1s finished 3rd, 4th, 5th and 13th. 1996: six F1 GTR ‘LM’s finished 4th, 5th, 6th, 8th, 9th and 11th. 1997: two ‘Longtail’s finished 2nd and 3rd. 1998: one ‘Longtail’ finished 4th, with a second withdrawn after an accident. Επόμενο άρθροFerrari: Όχι εντολές, αλλά… μόνο στην αρχή!